GARY STROUTSOS' live performances have captivated audiences around the world. His meditative flute music and time-honored stories evoke the lands and cultures that he has studied over the course of his 35-year career. Gary's mission is to carry the music forward to future generations and to promote stewardship of diverse cultures and the natural environment. Each of Gary's engaging and unique solo performances is distinct, drawn from the inspiration of the space and the audience. Gary's evocative musical style and use of humor transcends human differences in age and culture, connecting audiences in a shared contemplative space that transport them to a spirit of place. With this new album, Gary Stroutsos honors his friend and mentor Paul Horn with fresh interpretations of several Paul Horn classics as well as some of his own original compositions, performed with various flutes – including the Hopi one that Paul Horn loved. A new collaborative record with Cuban master musicians Lazaro Galarraga y Danilo Lozano that explores Afro-Cuban and Native American manifestations of spirituality. Click below to listen or purchase the album on iTunes. Physical copies will soon be available for sale in the store. 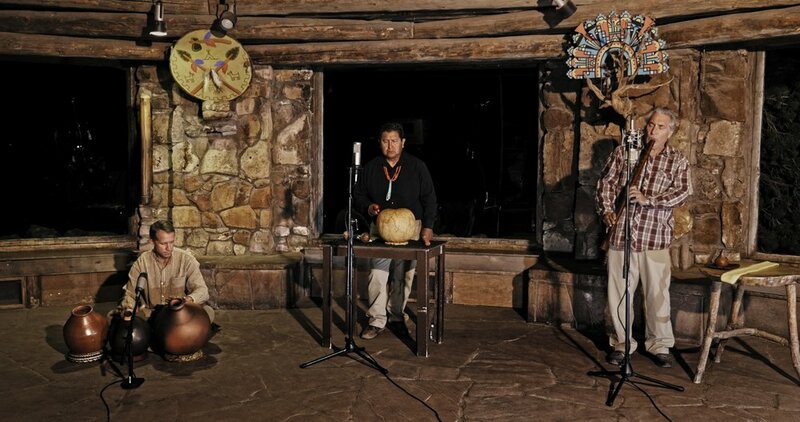 Gary Stroutsos is currently working with renowned Hopi singer Clark Tenakhongva to produce a CD and DVD featuring ancient music recorded inside the Desert View Watchtower in Grand Canyon National Park. Scheduled for release in Spring of 2018, this recording will be the very first of its kind — featuring the oldest sounds of the Southwest in a culturally and spiritually significant location. Available on PBS for a limited time.